Good morning! I hope you all had a great weekend! We had a snow storm on Saturday, as I was heading out to do my regular weekly grocery shopping. The store was crazy busy, full of people wanting to stock up on food before the snow got really bad. I think I got the last gallon of skim milk, and had to wait in a crazy long line to check out…but I made it home before 9 inches of snow came down. I just can’t wait for winter to be over! 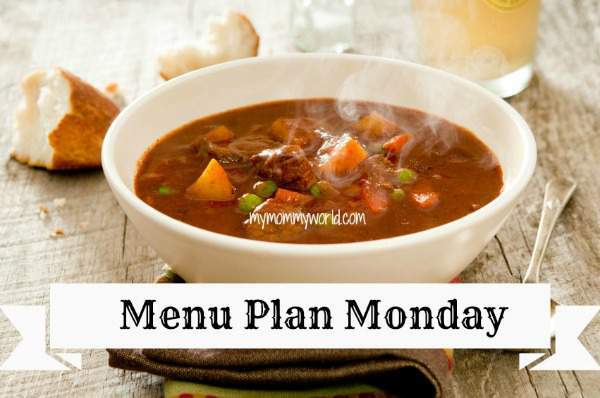 For more inspiration for your own menu, check out the Menu Plan Monday link-up over at OrgJunkie! What’s on your menu plan this week? I hope you break out of the constant snow cycle soon. I know this has been a hard winter for all of you. At least you were able to get some milk and home before the snow got bad. This week we will be having pizza too. I see the Sloppy Joe’s on your menu plan and I didn’t think of those when I was doing ours. I need to make a new plan soon, hopefully I’ll remember in the next few weeks to add it to my plan. My family loves Sloppy Joe’s. Oh thanks, Shelly! The cold and snow really wears on you after a while. I’m just thankful that our electricity stayed on! Your menu plan looks great. I would love to know more about the macaroni and hotdog dish. Found you from Menu Plan Monday at Org Junkie. Now following your social medias! Thanks so much, Cynthia! I definitely need to get that mac and cheesedog casserole posted…it’s so simple, but my whole family loves it! Your menu looks great, Erin. 🙂 I love chicken pot pie, but I don’t make it often because everyone else in my family doesn’t enjoy it as much as I do. I’m not sure they realize what they’re missing. Lol! I know what you mean…my husband doesn’t like any type of pie, which I just find crazy! I mean, who doesn’t like apple or pumpkin pie?